The world-famous golfer Arnold Palmer was given complete freedom in designing his golf course at The Bluffs Golf and Sports Resort. Located in beautiful West Feliciana Parish and its unique, rolling, south Louisiana hills, the Club has received numerous awards and accolades since its debut in 1988, including the recent 2016-2017 Voted No. 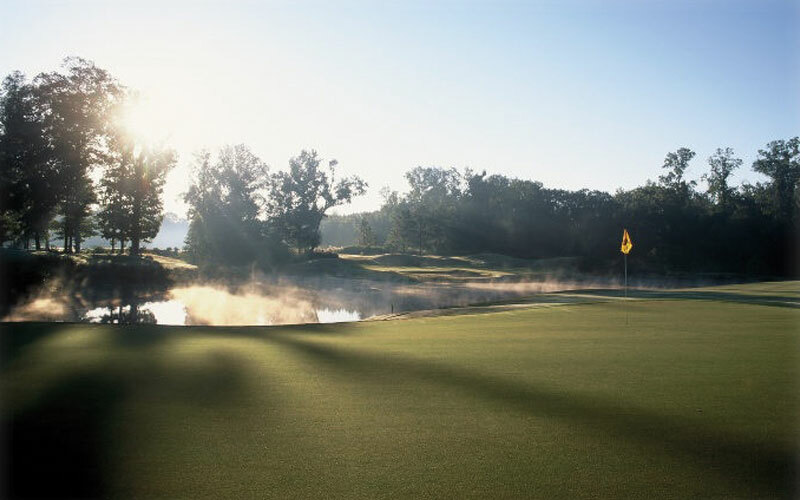 1 Best Golf Course You Can Play in Louisiana by Golf Magazine. Eight different routings were staked, walked, and thoroughly surveyed before selecting the best 18 holes. The diversity of the landscape in the Felicianas allows our golfers to enjoy spectacular natural beauty as they venture between dense forest edges and stroll along striking white-sand creek banks. Shots are made over hills, off bluffs, and into hollows as golfers traverse the diverse course that enjoys elevation changes of up to 50 feet in some areas. One of the most picturesque holes is the 17th, a clear illustration of the care taken to select the most spectacular scenic areas and dramatic golf holes for this unique and unforgettable course. Because of the striking natural beauty and careful attention to design, golfers of all skill levels will enjoy this Louisiana favorite. A quick and relaxing drive from Baton Rouge, this area known as The Felicianas, or “happy land,” is treasured for its natural beauty, much of which remains unspoiled. The historic district and other National Register properties in the parish are well-preserved and lovingly tended. Many areas remain similar to the way they were when famed artist and naturalist John James Audubon made West Feliciana Parish his home in the 1820s. Holes 11 through 13 of our course are in a location where Audubon once studied and illustrated the local birds. Thirty-two of the artist’s renowned Birds of America paintings were made while he resided in this area.